Helen & Chris Road Trip USA: Published!! 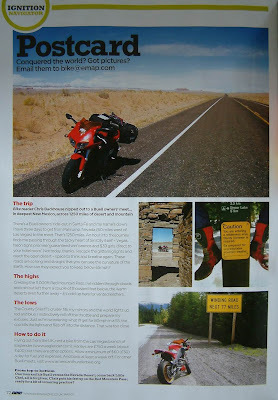 Some time ago Chris sent an article about his bike trip to Santa Fe to Bike Magazine in the UK. The trip happened last October and the article was soon forgotten and nothing was heard from the mag. Imagine our surprise when we bought a copy of the May edition of Bike yesterday in San Diego and while flicking through the articles Chris thought that a certain photo looked rather like a picture he had of his trip. On closer inspection the bike in the the picture even had a Union Jack sticker on the front just like Donkey has.....wait a goddam cotton-picking minute here.... Yes! He's famous. A whole page glossy full-page spread of his trip - with his edited down words and 4 fabulous photos. I'm so proud. This is so COOL! Bike is like the 'leading' bike mag in the UK and this is just so darn excellent! And this comes just ONE day after Pat phoned us to say she'd be browsing through Chris's Mensa Magazine that arrives at her house each month back in the UK when a rather dashing photo of her son caught her eye. It accompanied an article he'd written about Life Coaching and again it was sent off quite a while ago and although the editor had expressed an interest in using the article he hadn't confirmed when it would be featured. SO 2 BRILLIANT SURPRISES in 2 days!